I will now prove by scientific facts and logic that so-called antibodies which are said to call in white blood cells to attack viruses which also do not exist is a fallacy. Antibodies by scientific definition are classified as proteins. Proteins are my definition, molecules. A molecule by definition is two or more atoms that stick together. I quote. “Proteins may be purified from other cellular components using a variety of techniques such as ultracentrifugation, electrophoresis and chromatography. Chromatography, is a separation of a mixture. And there it is in black and white. They use a centrifuge machine to separate the substance into particles and the electron microscope to visualize the particles. Then all they do is name the particle and say it’s alive. You don’t have to understand all this medical mumbo jumbo in order to understand there is nothing that is alive in the particles that have been separated. The virologist can take any product or substance and centrifuge it into particles. The next time you hear or read about particles (virus) you need to ask one question. What is the source of the material their using and how was it extracted and finally what instrument did they use to see it. White blood cells, absolutely, they can be seen under a dark field microscope. Antibodies, show me just one circulating in the blood stream and attacking the so-called “live virus.” It will NEVER happen because it has never happened, because neither the virus nor the anti-body exist, except in the mind of the lying virologist. All we the anti-vaxer need are the facts and some common sense with a tad of logic to expose these myths promoted by the vaccine sellers. Here is just one example of your ‘virus.” Virus is defined as a poison, like in snake venom. The poison9virus) used to make vaccines is derived from the product of disease, like the pus from the arm of a person with small-pox. Guess what the poison (virus) is in making the flu vaccine. If you said nasal discharge you are correct. The last I read the discharge (snot) sorry to be so explicit, but this tends to stick in the mind better and shows how depraved these virologist reall are, the material comes from pigs. Pigs that are injected with other poisons that gives them the cold symptoms in the first place. Epidemiological and toxicological data suggest that chronic intoxication's are the real cause for the named diseases AIDS, Hep C and BSE. Why these plausible hypothesis aren´t investigated further, this is a topic one could write a book about which could have the title "conflicts of interests". 2. The therapy business: Antiviral medication, 3 or 4 or 5 fold combinations, AIDS can´t be topped in this department. 3. Possibly vaccinations: Here, however, the concept of the new big plagues gets in the way of itself, because this has brought up the central paradox of immunology. Since the beginning of HIV they have told us: He who has antibodies to HIV, will die, instead of, he who has antibodies to HIV will live, which would meet our vaccination concepts. How many HIV antibody negative individuals would like to get vaccinated, in order to have antibodies to HIV afterwards? With intoxication hypotheses on the other hand you cannot make any money at all. The simple message is: Avoid the poison and you won´t get sick. Such hypotheses are counterproductive insofar as the toxins (drugs, alcohol, pills, phosmet) bring high revenues. The conflict of interests is not resolvable: What virologist who does directly profit millions from their patent rights of the HIV or HCV tests (Montagnier, Simon Wain-Hobsen, Robin Weiss, Robert Gallo) can risk to take even one look in the other direction. "In order to better grasp the issue of vaccine effectiveness, it would prove helpful for us to go back to the early theoretical foundation upon which current vaccination and disease theories originated. In simplest terms, the theory of artificial immunization postulates that by giving a person a mild form of a disease, via the use of specific foreign proteins, attenuated viruses, etc., the body will react by producing a lasting protective response e.g., antibodies, to protect the body if or when the real disease comes along. Despite these significant shifts in scientific thinking, there has unfortunately been little actual progress made in terms of undertaking systematically broad research on the multiple factors which undergird human immunity to disease, and in turn building a system of prevention that is squarely based upon such findings. It seems ironic that as late as 1988 James must still raise the following basic questions. "Why doesn't medical research focus on what factors in our environment and in our lives weaken the immunesystem? Is this too simple? too ordinary? too undramatic? Or does it threaten too many vested interests . .
"FROM REPEATED medical investigations, it would seem that antibodies are about as useful as a black eye in protecting the victim from further attacks. The word "antibody" covers a number of even less intelligible words, quaint relics of Erlichs side-chain theory, which the greatest of experts, McDonagh, tells us is "essentially unintelligible". Now that the old history, mythology and statistics of vaccination have been exploded by experience, the business has to depend more upon verbal dust thrown in the face of the lay public. The mere layman, assailed by antibodies, receptors, haptophores, etc., is only too pleased to give up the fight and leave everything to the experts. This is just what they want, especially when he is so pleased that he also leaves them lots and lots of real money. 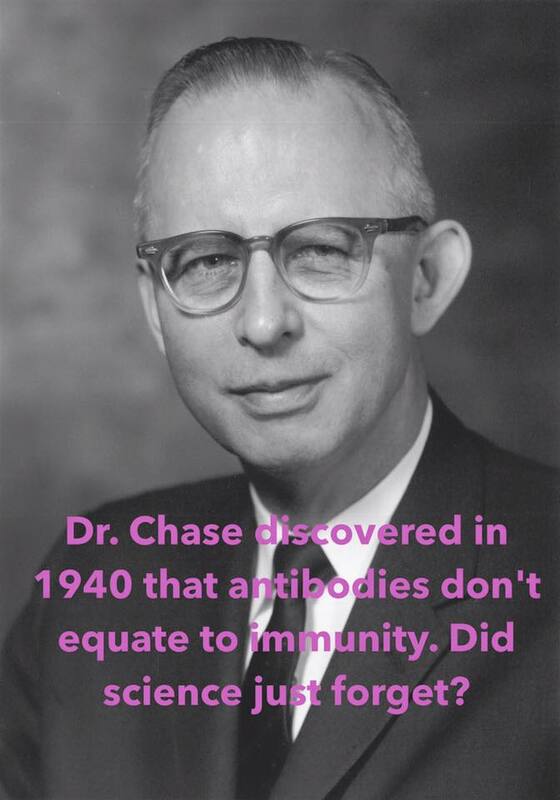 The whole subject of immunity and antibodies is, however, so extremely complex and difficult, especially to the real experts, that it is a relief to be told that the gaps in their knowledge of such things are still enormous.